Halloween was SUCH fun! 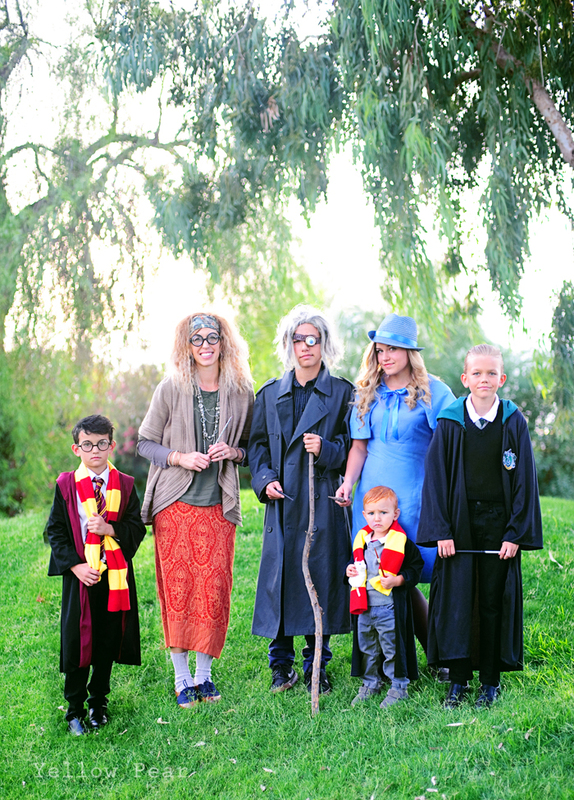 We dressed up as Harry Potter characters and everyone had a great time getting into character. We did a lot of thrift shopping and making things out of what we already had available. 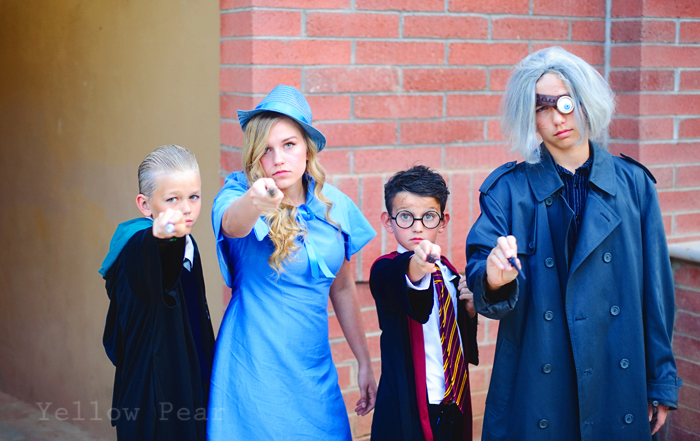 Miss B made custom wands for everyone. She used dowels, chopsticks, paint, hot glue, wooden balls, tape, and sculpey clay. They turned out AMAZING! 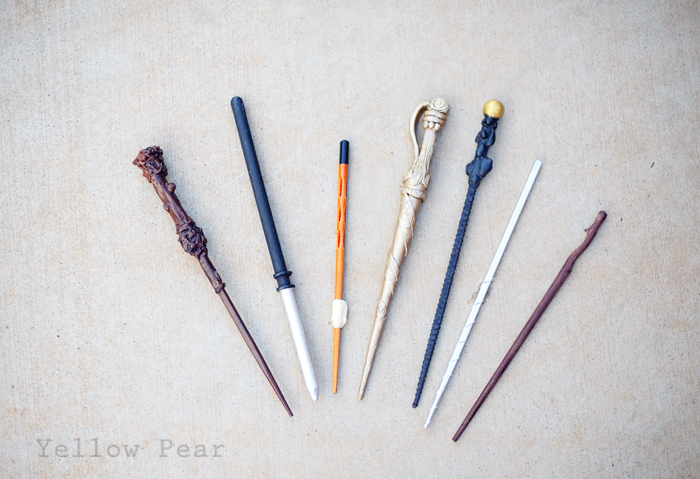 From L-R the wands belong to Harry, Draco, Ron, Fleur, Moody, Trelawney and Professor Lupin. Mr. C was Professor Moody and he looked so awesome. We just used an old trench coat that we had already, black shirt and pants, a dirty grey/blonde shaggy wig and the sweet eye patch I made out of a ping pong ball, a leather cuff, some elastic and a plastic bottle cap. 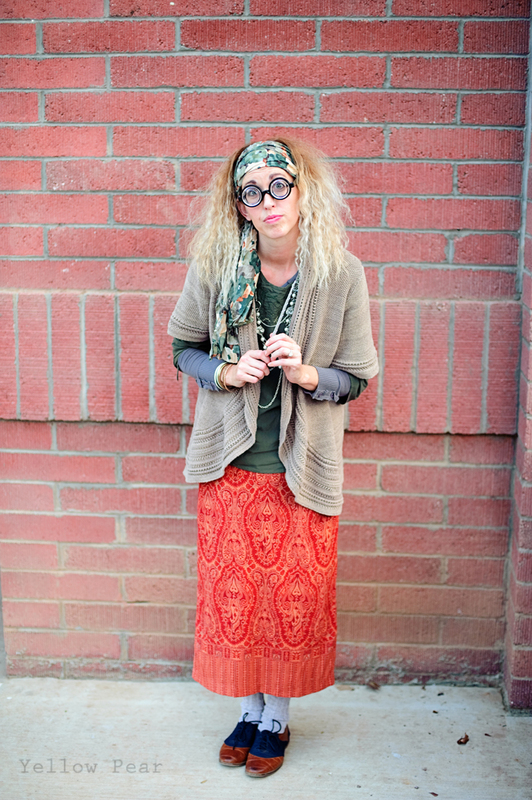 I was Professor Trelawney and it was a blast! I gathered some items from my closet, my mom and thrift stores and put my hair in tiny braids the night before. Then I hair sprayed and ratted it out as much as possible. I wore coke bottle gag glasses and couldn't really see out of them at all, but they looked legit! Miss B was Fleur Delacour and we lucked out and found a dress at Goodwill that I took in to fit her better. 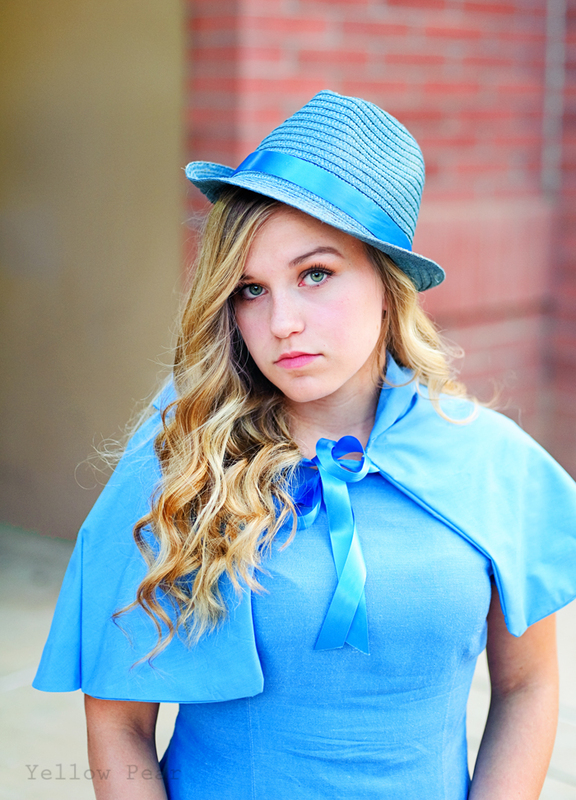 We spray painted a straw hat blue and glued the side up and added a ribbon. We also lucked out and found fabric that matched the dress perfectly and I whipped up a little capelet for her. 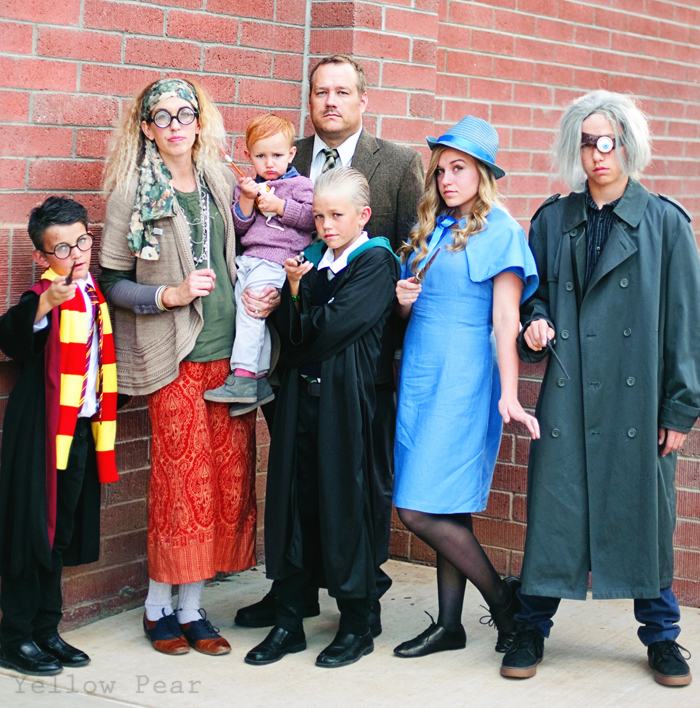 We got Dad to dress up again this year and he was Professor Lupin. He wore a tweed jacket and neutral shirt and tie and we drew on some scruff and scars and a little mustache! 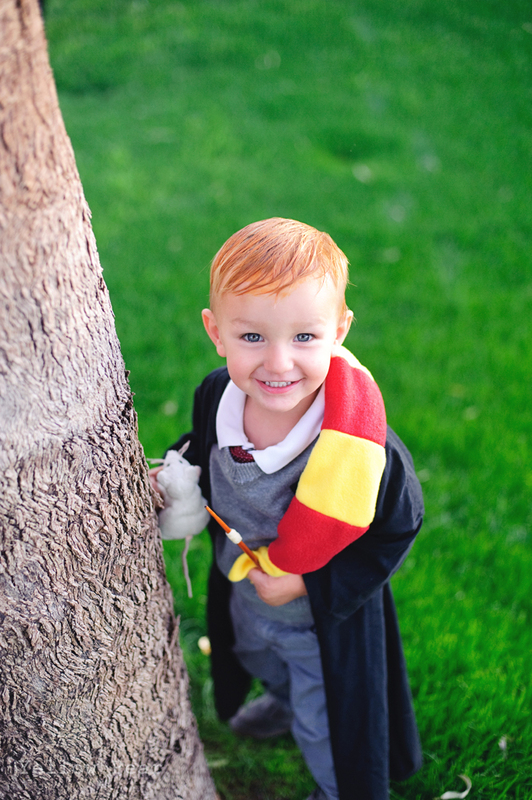 Q was our very own Harry and he looked SO great! His costume was super easy. 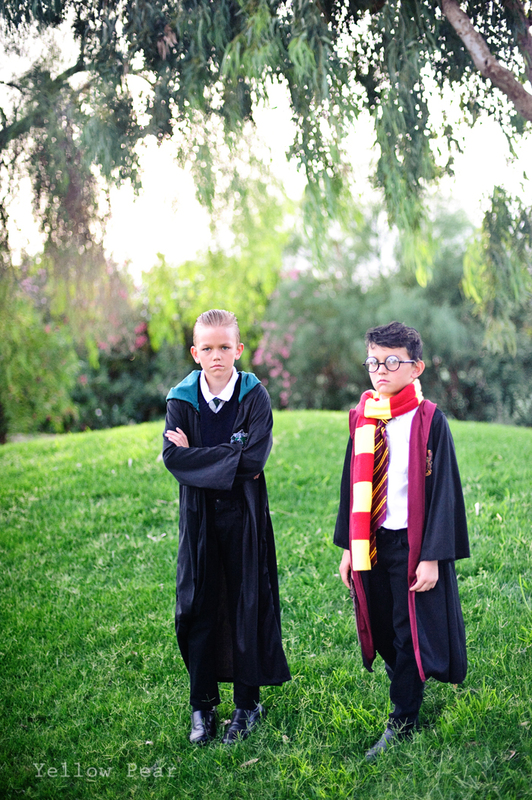 We borrowed the robes and tie, I bought the glasses, made a quick scarf and spray painted his hair black. We added a lightning bolt scar, a white shirt, black pants and black shoes. Easy! WP was Ron. We first had him in Ron's R sweater but decided he didn't look Ron enough and whipped him up a mini cape, sweater vest (I made out of an old sweater of Mr. C's), a tiny scarf and a rat! We also painted his hair with watered down orange acrylic paint. We can't wait for Halloween 2017...do you have any ideas? ?